With stats finally in from Q2 lets dive in for both my take and a nice tally of articles below. Following up on my last market update, I’m holding firm to what I’ve been sharing: I believe this is the peak year in an up-cycle that has been very robust since 2011. No doomsday here, just a temporary adjustment for a few years that is likely to happen. And, it’s not because of job concerns. Job growth is robust for 2016 at 3.5% (though I do see a drop from the pace of years past). This has everything to do with current affordability. Average household income (at $72K currently) is up 8% since 2010, and yet home prices per the visual below have moved up average of 40% during same period. It is normal to have a delta but a 32% delta between price-to-income ratio is too large. This gap will close given the continued growth/jobs Austin will experience and therefore not a long-term issue, but within the current cycle it’s causing us to peak out . Based on above + the following points I believe we will see and average of 10% pullback in pricing over the next few years across the market. In 2020 that 10% loss will get recaptured and move beyond as the next cycle starts. Supply of housing in a balanced market is 6-6.5 mths, an equilibrium market between Buyers and Sellers. Supply above $1M is at 11+ mths compared to 8.5 mths a year ago, it’s oversupplied. Supply between $500k-$1M is at 8 mths compared to 5 mths a year ago, starting to get oversupplied. Supply between 0-$500k is at 3 mths compared to 2 mths a year ago, holding strongly. However, as the other bands are peaking, this price range will follow in 6 mths in my opinion. 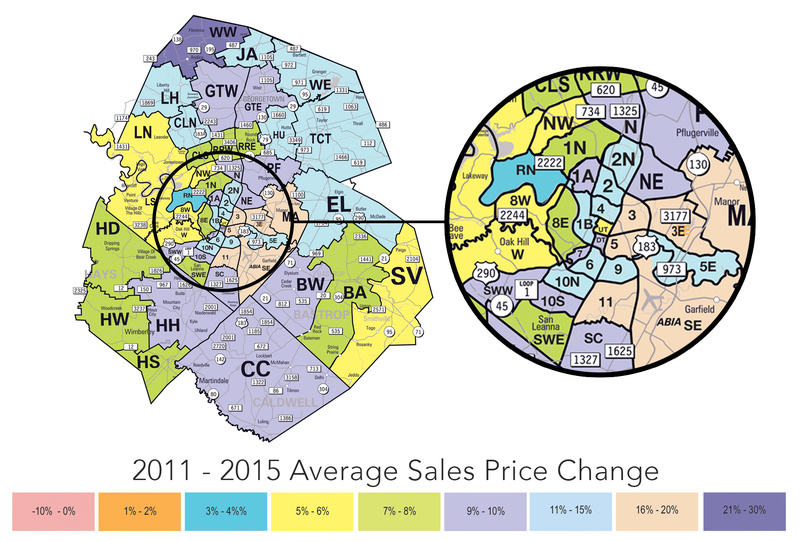 Sales within city limits lower in both 2015 and 2016 compared to outside city limits, first time on record. In closing, I’m bullish long-term about our market. We are poised to do well long-term with the likes of being ranked #2 Tech City in the WORLD, Best City for Young Families and one of Top 10 Most Educated Cities . In the short-term, it’s time to be mindful and strategic in selling or buying, and of course your sub-market will react a bit differently which I can cover personally with you.